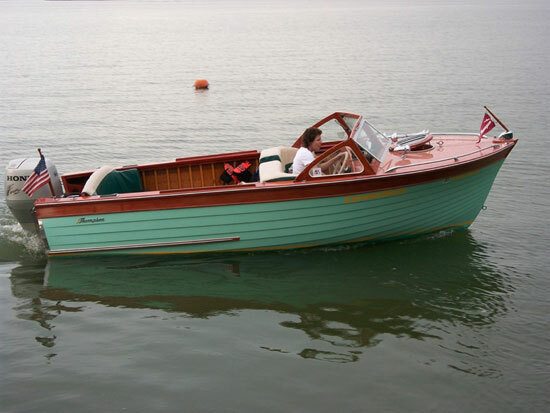 Miles, The boat came with twin 1959 Johnson 35's, one had a blown head so I never ran them. The owner thought it ran 28 MPH with them. I bought it in 2000 and installed the 1998 Honda 90 that pushes it 38 MPH with a 4 blade 19" Comprop @ 5500 RPM. In the summer I use a 17" to pull skiers. The weight of the 378 lb. Honda does not seem to be a problem at all. Mileage is almost 6 MPG! The transom was replaced with triple laminated Mahogany and all the side decks were replaced with solid Mahogany. The foredeck was stripped with Mahogany glued to the original plywood. The original side decks were plywood which were removed. I installed a Chris Craft deck hatch, added the monkey rails, and siren. The dash was replaced as well as it was full of holes from the twin motor installation, and the steering wheel was centered too close to the starboard for comfort. The center front seat bottom section was removed so you could walk thru instead of having to step over. All the wood work was done professionally by Nomad Marine of Fort Worth, TX. After a few years of leaving it in the water during the summer months the keelsons began to hog which slowed it down to 15 MPH at full throttle. The hook was close to half an inch over 6-8 feet of the bottom. I straightened the keelsons with 4 water barrels over several months by blocking properly on the trailer and sistered new keelsons so the bottom is straight as a board, hence the nice top speed. The keel did not hog, only the side keelsons. The Honda has been running for 12 years and has between three thousand and four thousand hours on it. It has the original impeller and spark plugs. I have only replaced the fluids and control cables. I have also installed a Red Dot heater that runs off the hot water from the engine with a 2 speed blower mounted under the pilot seat. Cockpit steps are from a Trojan cruiser that was beyond repair. The new hull color last year gave it a new personality and after 10 years it was time to recoat the Smith's 5 Year Clear Polyurathane. It doesn't look as good as varnish during the first year but looks better in the last 9 years. I got the color from Geo Kirby Paint Co. and then took a can of Easypoxy, Tan, to Lowe's and they matched the color. When I look at old photos of her with white sides it looks too boring! 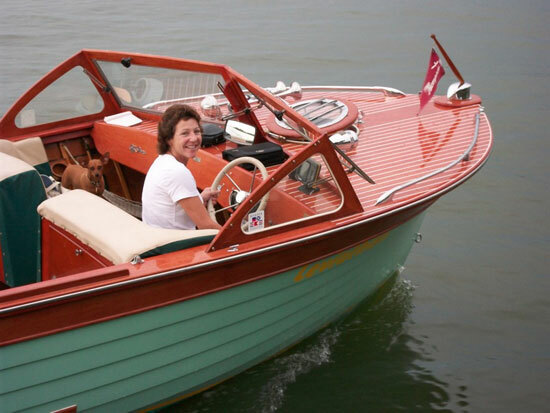 This is the best wood boat I have owned.